Beginning August 28, 2018, sports promoters in Missouri will need to comply with several new requirements, among which is a higher surety bond amount. As of that date, surety bonds for sports promoters will be increased from $5,000 to $25,000. This and several other new requirements were part of the recently passed House Bill 1388. As a result of the increased bond amount, promoters will also need to pay a slightly higher bond cost when obtaining their bonds. Read about the new amount, and other important changes introduced by the bill below! Missouri House Bill 1388 was signed into law on June 29, 2018. The bill repeals several sections of the Revised Statutes of Missouri (RSMo) and enacts nine new sections which concern sports contests in the state. Several of these new sections which are located in Chapter 317 of the RSMo concern sports promoters in the state directly. Under the new law, amateur kickboxing, as well as amateur and professional mixed martial arts are now also regulated and supervised by the Missouri Division of Professional Registration, Office of Athletics. This includes issuing licenses for contestants in these categories, regulation of the contests themselves, fees for such licenses, etc. The inclusion of these arts means that contests in these categories will need to have the approval of the Division prior to being promoted and organized. It also means that bout contracts that are signed between promoters and contestants will now also need to be signed with contestants in all of the above categories. Moreover, prior to being issued a promoter’s license, applicants will now have to submit a $25,000 surety bond, rather than the $5,000 bond required previously. The bond is conditioned to provide coverage for any taxes and fees that are due to the Office of Athletics. The bond will also cover any expenses of contestants or officials should a promoter default on their obligations. The Office may also require applicants for a promoter license to post another bond if it is determined that the amount of the initial bond will not be sufficient to cover potential claims. Finally, the bill also includes new rules regarding the use of elbow and knee strikes during amateur contests. As of August 28, 2018, sports promoters in Missouri will need to comply with the new surety bond amount requirement. At that time, to remain licensed, current sports promoters in the state will need to have obtained a surety bond that increases their bond amount to $25,000. New applicants for a promoter license, on the other hand, will only be granted a license after submitting a bond in the required amount. 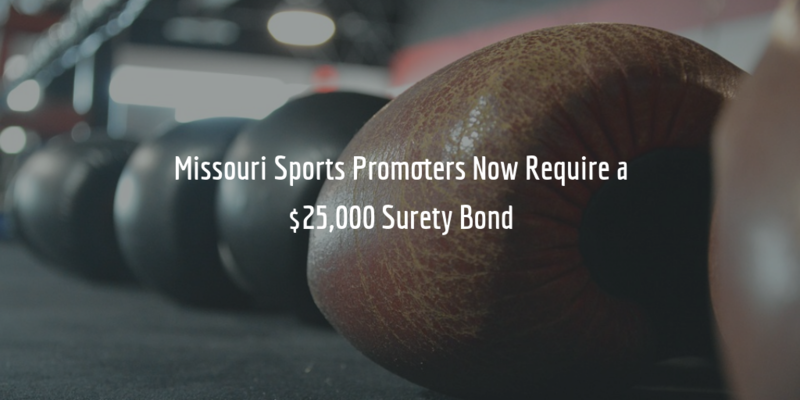 With the increase of the amount of sports promoter bonds in Missouri, the surety bond premium for promoters will also change. Of course, as with all bonds, the specific premium that needs to be paid by bond applicants is determined on a case-by-case basis. An applicant’s credit score is the main factor that influences the exact cost of their bond. At times, other factors such as financial statements or an applicant’s resumé may also be taken into consideration. The higher an applicant’s credit score, the lower their bond rate will be. For example, an applicant with a credit score of 700 FICO or more, can expect to be offered a rate of 1%-3% of the total amount of their bond. This would mean a premium of between $250-$750. Want to know how much your own bond will cost? Complete our bond application form and we will contact you with a free and exact cost on your bond as well as with further details about getting bonded. Do you have any further questions about this bond? Call us at 877.514.5146 to speak to our professionals and learn more!